Are there side effects or downsides to the treatment choices? Varicose veins are a common condition in both men and women, and though we more readily associate them with old age, younger adults can get them too. Not only are these enlarged blood vessels in the lower leg unflattering, but they also cause discomfort and pose serious health risks. Regardless of whether or not you experience pain, the appearance of varicose veins can lead to feelings of insecurity. Therefore, people often have them removed for cosmetic reasons. Being that varicose veins affect normal veins, they are considered a vascular condition. Normal healthy veins have valves that assist the process to return blood flow from the legs back to the heart. 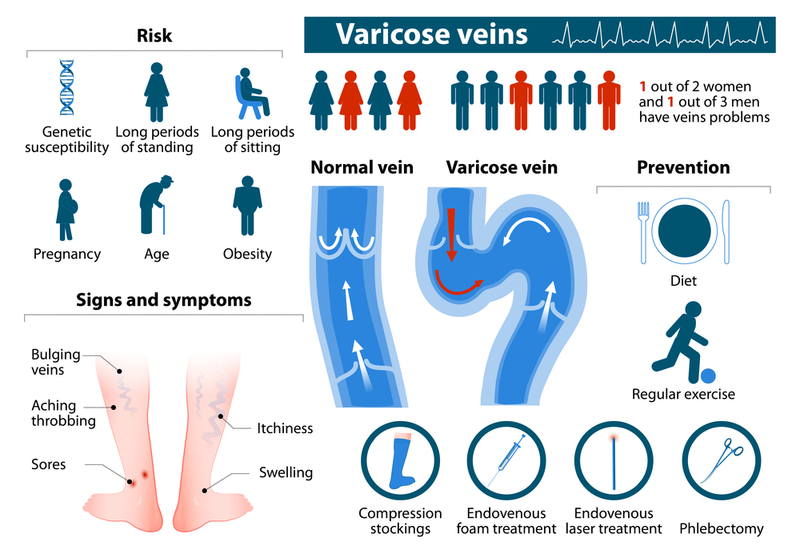 With varicose veins, the theory is that there is either damaged or weakened valves, or weakness in the vein wall that causes a physical malfunction known as venous insufficiency, venous stasis or venostasis. Varicose veins are not to be confused with deep vein thrombosis (DVT), a more serious condition that occurs when a blood clot forms in one or more of the deep veins in the legs. DVT can happen if you don’t move for a long time, such as after surgery or following an accident, causing blood clots to block the blood flow in the lungs (pulmonary embolism). For the most part you will experience dark veins, usually a blueish/purple color. They may look swollen and lumpy. Blood travels from the heart to different areas of your body through one way vein valves. If the vein walls become elastic and less flexible, blood may begin to leak backward and flow in the opposite direction. When this occurs you can end up with a swollen vein, or varicose vein. Usually veins that are furthest from the heart are most likely to be affected. This is why a lot of the time varicose veins are found in the legs and/or feet area. Though varicose veins are usually fairly obvious, your doctor will reach a diagnosis by palpating the veins and examining the skin discoloration and texture of your legs while you are sitting and standing. You will also be asked questions about your family history, and asked to describe any other symptoms you might have such as heaviness, tiredness in the legs, swelling, cramps, tingling, itching, numbness and pain. “Larger varicose veins should be examined with a Doppler ultrasound before treatment, to be sure that they are in fact ‘extra’ vessels that are not actively carrying blood to the heart/larger feeder vessels,” says Beverly Hills dermatologist and university clinical instructor Dr. Tsippora Shainhouse. Once a diagnosis has been reached, your doctor will then discuss the range of treatment options available. “There are multiple treatment options available, depending on the patient’s anatomy, other medical problems and personal preferences,” says general surgeon Dr. Brian Heeringa of Northern Michigan. Compression stockings are often a first line therapy for varicose veins. Dr. Heeringa informs that trying compression for a period of time is often an insurance company requirement before they will cover treatment of varicose veins. Sclerotherapy involves the use of chemicals injected into the varicose veins, which subsequently causes them to shrink, scar up and gradually disappear over a number of weeks. “Common chemicals used in the United States include hypertonic saline and sodium sotradecol. Foam versions work best for larger, blue varicose vessels,” says Dr. Shainhouse. After the procedure, “you should continue to wear compression stockings for two months, to make sure that the veins do not re-open,” adds Dr. Shainhouse. You may also need subsequent treatments for larger varicose veins. “While external laser treatments can help treat dark purple veins and blue veins through the skin, it is most effective to guide a laser into a vessel through a fiber-optic wire and zap them from the inside,” says Dr. Shainhouse. This is known as endovenous laser treatment, an image-guided method that “causes the vessel wall to collapse and scar down and is eventually broken down by the body,” informs Dr. Shainhouse. Endovenous laser treatment is conducted with local anesthetic. “VenaSeal is the latest treatment option,” says Dr. Shainhouse. “It involves the injection of a medical-grade adhesive that literally shuts the varicose veins permanently. It can usually be performed in one session.” This treatment involves a number of needle sticks into the vein and is performed with local anesthetic to minimize any pain or discomfort. Unfortunately, approximately 9.4 percent of women acquire varicose veins during pregnancy. Dr. Shainhouse informs that exercises like walking, swimming and flexing the leg muscles help because these recruit the calf and thigh muscles surrounding the vessels to help push the blood through them. This helps prevent pooling and stretched out vessels. Further to this, Dr. Heeringa suggests that high heels should be avoided or their use minimized as much as possible, as wearing them limits the pumping action of the calf and increases your risk of developing varicose veins. Additional prevention methods include elevating the legs when seated and wearing compression stockings during the day, especially if you work in a profession where you’re on your feet for long periods of time – healthcare workers, hairdressers, teachers, chefs and such. Just remember to remove the compression garments at bedtime.